Palliative care is an interdisciplinary approach to addressing the needs of a patient (usually with chronic or serious illness), including spiritual, psychosocial, and physical needs. This model was developed in the United Kingdom in the 1950s and came to the United States in the 1960s. Research suggested that it helped terminally ill patients feel better and live longer than predicted. The archdiocese promotes palliative care as a way to combat the advancement of physician-assisted suicide, which is seen as an answer to patient suffering. The Initiative on Palliative Care and Advanced Care Planning was founded in 2015 with the goal of educating people, parishes, and organizations within the archdiocese on palliative care. The theme for this year's colloquium was "Moral Distress on Both Sides of the Bedrail: Always Wanting to Do 'The Right Thing.'" MC Sullivan, chief ethicist and director of the Palliative Care Initiative, said that this year they used a kind of "narrative ethics presentation." "We used people's stories to talk about points that they wanted to make. And it mostly came from lessons they learned that they thought were applicable and helpful for other people," she said, speaking to the Pilot on April 8. The first speaker was Dr. Joseph D. Stern, a practicing neurosurgeon and author of the memoir "Grief as My Guide: A Brother's Loss through a Doctor's Eyes." He spoke about caring for his sister until her death from leukemia, followed by the death of his brother-in-law. 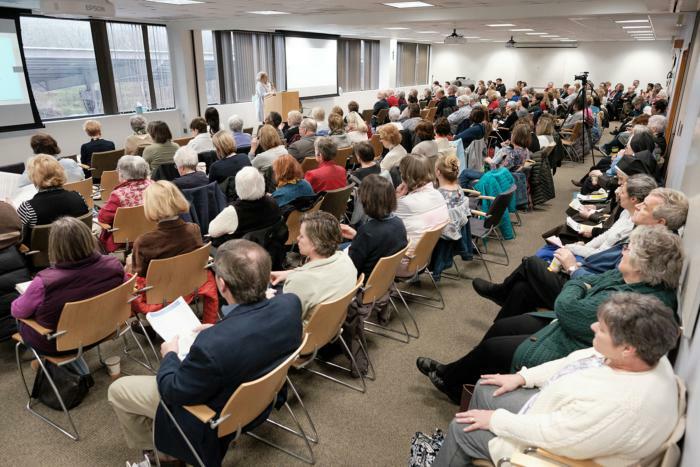 Dr. Mary Buss, a medical oncologist and a palliative medicine specialist, who directs the outpatient palliative care clinic at Beth Israel Deaconess Medical Center also addressed. She talked about specific patients and how their stories related to her and to her fellow caregivers. Both Dr. Stern and Dr. Buss shared statistics about the care of the dying and the need for increased palliative care. Sullivan said they both made clear "the need for people to know sooner about palliative care, how it's different from hospice care." Hospice is strictly for patients who are dying, whereas palliative care can be provided to patients at any stage of illness. Not all palliative care is hospice care, but hospice care is always palliative care. The final speaker was Fran Hauck, a social worker, part-time chaplain at Brigham and Women's Hospital, and member of the pastoral staff of Holy Name Parish in West Roxbury. Though she works in bereavement and grief support, she spoke from her own experience of caring for her dying parents and her husband. "All three speakers were profoundly moving," Sullivan said. She said the speakers were "so pleased with our initiative" and "profoundly grateful to us" for inviting them. "When each speaker was as moved by the next speaker, as people were by them, it was wonderful. You cannot improve on that in terms of programming content," Sullivan said. Colloquium attendees filled out evaluations to give feedback on the presentations. Doctors, nurses, social workers, and chaplains could receive continuing education credits for attending the event. The evaluations used each year also give attendees the opportunity to indicate topics they would like to explore at future colloquiums. "It's always nice to hear that we're giving them what they want, that we have a good finger on the pulse of what the community wants to know and hear, and we bring it to them," Sullivan said. She added, "That gives us a tremendous feeling of satisfaction, that we're answering unmet needs for our community." Sullivan said one question the Initiative receives repeatedly is, "Why aren't we hearing about this in our parishes?" In fact, she said, the office tries to schedule visits to parishes to educate people on palliative care. "We always use this as an opportunity as well to remind people to go home and ask their pastors and pastoral associates to get in touch with us and invite us out to their parishes," Sullivan said.